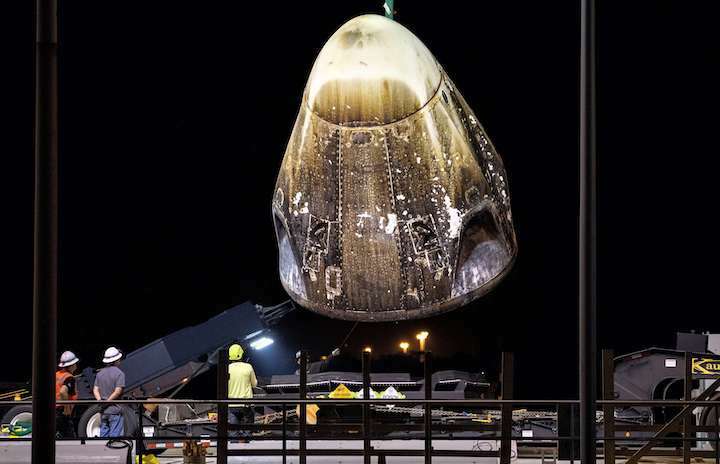 SpaceX CEO Elon Musk says that the company’s next-generation Crew Dragon spacecraft is a “major improvement” over its Cargo Dragon (Dragon 1) predecessors after successfully demonstrating a number of reusability-focused upgrades during the vehicle’s launch and splashdown debut. Even as SpaceX’s longer-term development groups aim to make the company’s Dragon spacecraft all but redundant with Starship and Super Heavy, the apparent success of Crew Dragon’s upgrades will be valuable for years to come. Ultimately, “major” improvements in reusability will allow SpaceX to reuse Dragon 2 far more efficiently, improving availability for both its Crew and Cargo programs and potentially cutting the operating cost and longevity of each spacecraft as the company begins to transition its workforce to BFR. Although the question cuing Musk was non-specific, the SpaceX CEO immediately focused his reply on whether or not unspecified “upgrades” to Crew Dragon were able to keep sensitive hardware dry. SpaceX’s Cargo Dragon program has roughly seven years of experience with launching, recovering, and refurbishing orbital-class spacecraft after ocean landings and the subsequent seawater immersion. The fact that the Dragon 2 concept was almost immediately demonstrated with propulsive land-landing capabilities speaks to just how annoying a problem it was to try to keep an orbital spacecraft easily reusable while still relying upon water landing for recovery. As it turns out, many of the engineering solutions best known to ensure structural and thermal integrity of a spacecraft on-orbit are often at ends with the separate task of ensuring that the same spacecraft remains thoroughly water-proof through launch, reentry, and splashdown. Many of these problems center around the materials that are best for each solution. The sorts of polymers (i.e. plastics) best known for their roles in sealing certain things off from other things are frequently very pliable, soft, and flexible. The orbital environment is extremely unfriendly to polymers like this, where constant and extreme thermal cycling couples with vacuum, radiation, and something known as atomic (or free radical) oxygen to rapidly turn pliable polymers brittle. Different sealants and plastic or rubber gaskets are visible all over Crew Dragon, ranging from the red gasket around the nose cone area to white lines filling in gaps between the spacecraft’s dozens of different external panels. A ‘brittle seal’, as many will know, is an oxymoron. Sealants that become brittle in space often scarcely behave like sealants at all after weeks (or months) in orbit, meaning that their ability to prevent moisture intrusion can be dramatically deteriorated. From an engineering perspective, Crew Dragon’s many seals and gaskets are first and foremost intended to protect the spacecraft from the elements while still on Earth, where static fire attempts and weather during launch windows could require it to weather extreme heat, cold, rainstorms, ice, and high winds. SpaceX engineers appear to have managed to solve the latter problem while also accounting for a need to protect the spacecraft afterlaunch for the sake of easier refurbishment. However, sealing the spacecraft from the elements – both before and after launch – is just one of many challenges for safe operations and efficient reusability. Up next, as Musk notes, is protecting Crew Dragon’s 16 Draco maneuvering thrusters and 8 SuperDraco abort thrusters from water damage, as well as sealing off vulnerable avionics for reuse. With respect to avionics, Musk is very likely referring to the electronics and sensing equipment housed under Dragon 2’s retractable nose cone, a new feature for SpaceX. 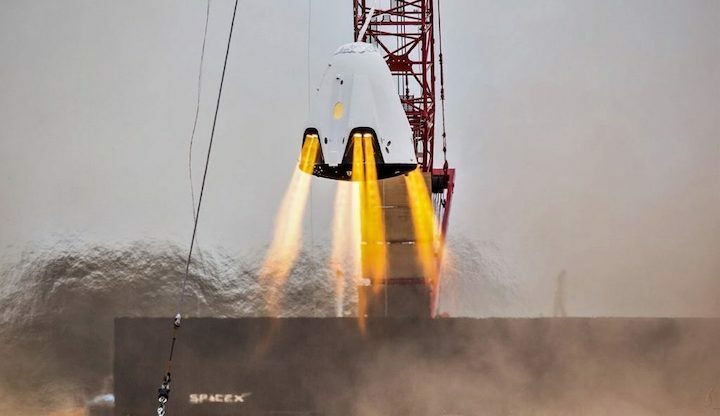 Due to the fact that Crew Dragon’s SuperDraco abort thrusters are only meant to be used in a namesake abort scenario, SpaceX appears to have chosen to implement a more permanent solution for protecting them from water intrusion after splashdown. The challenge of panels like those covering the SuperDracos is that they need to be easily destructible to prevent a cascade of high-velocity debris from wreaking havoc in the event of ignition. They also need to survive the conditions on orbit, make it through the heat and buffeting of reentry and descent, and survive the initial impact with the ocean surface, all while keeping SuperDracos dry. As such, it should come as no surprise to find CEO Elon Musk praising the engineering behind the presumably successful solutions to these complex problems, although credit is also due to the technicians that turned CAD files, test results, and aspirations into practical, functioning hardware. 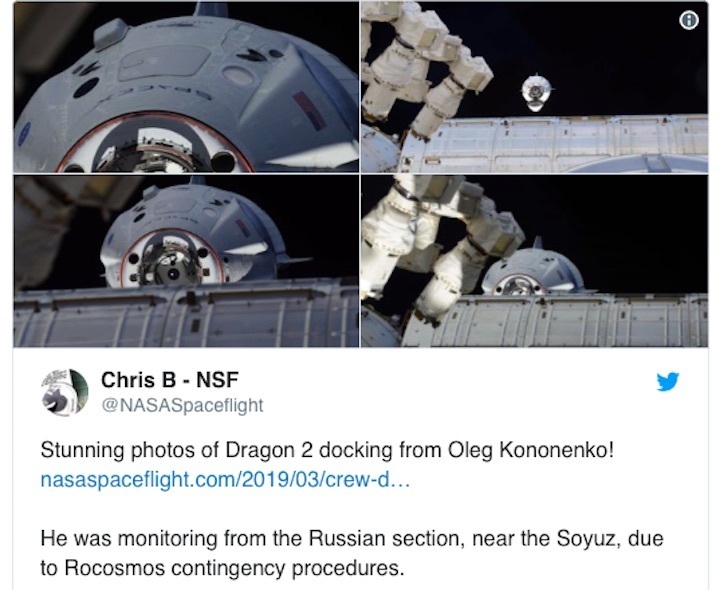 If Crew Dragon can achieve a similar level of success after spending more like half a year in space during operational crew transport missions, the spacecraft’s reusability improvements will end up benefiting both Crew Dragon and Cargo Dragon 2. 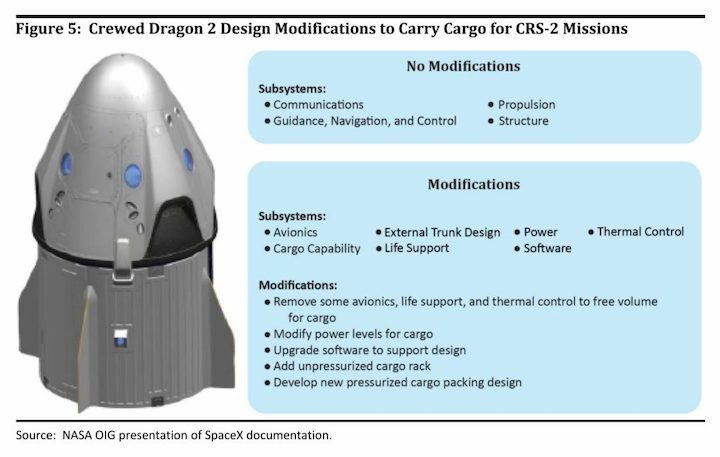 The Cargo variant of Dragon 2 is designed as a relatively minor modification to flight-proven Crew Dragon capsules and slightly-upgraded trunks and could debut as early as mid-2020 after Cargo Dragon 1 enters retirement.